Before you see the mood board, I wanted to provide you with a summary of the book and a little bit about the author! This definitely won't be a surprise, but I absolutely loved Charlie. Howard was one of the most interesting "side" characters that I have ever read about, and it would be extremely interesting to read another story from his point of view. I mentioned this in my review of this book, which is going live on the blog soon, but the disability representation was amazing & I connected instantly with Howard. (If you don't know, I'm disabled and I have a "funny walk" like Howard!). Did you pick any specific characters or scenes to be represented in your Mood board? I definitely wanted to pick up on the change in location throughout the book. I wanted to capture the mountains, while also capturing how Charlie might be feeling about the move. 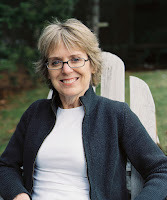 Most of the pictures are actually from descriptions in the very beginning of the book - Charlie thinks that the only thing in North Carolina is dirt roads, and that the people who live there eat squirrels for dinner. 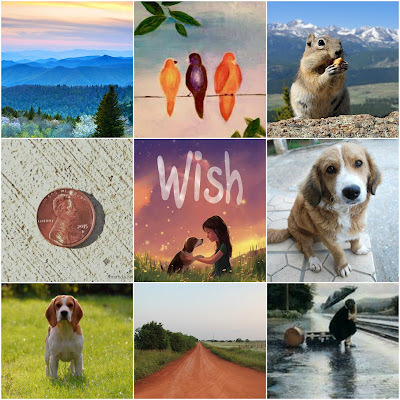 The other part of the moodboard is divided between Wishbone (the dog) and Charlie's wishes. Charlie knows almost every way to make a wish, whether it be seeing three birds on a wire or picking a penny up from off of the ground. 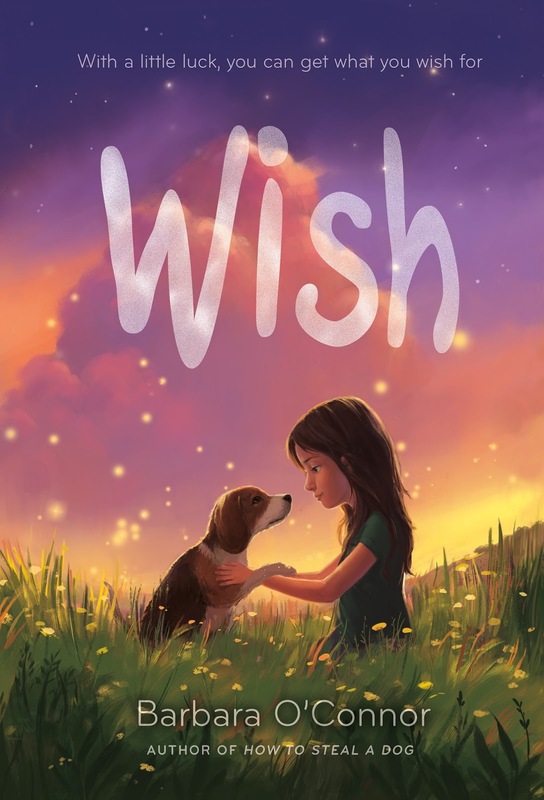 Especially when her wish involves Wishbone, the stray dog she meets, I couldn't leave him out! No, it didn't! I honestly think that this is one of the only mood boards I have created where there really is not a clear color scheme! I guess the pictures I found just didn't mesh together -- but it definitely makes for an interesting mood board! I really wanted to find a picture of Charlie on her bike, seeing Wishbone. It is a very pivotal moment in the book, and I would have loved to represent that in my mood board. I'm not going to say much more than that -- because I don't want to reveal much more than that -- but it was very hard for me to find a picture like that. I am extremely happy with the pictures that I found, though! I read the book a while ago, but my review for the book isn't live yet! You can look for my review a little bit later on my blog! I rated this book 4 out of 5 stars, and it was such a quick and enjoyable read! Thanks to Macmillan/Farrar, Straus and Giroux, I have a giveaway for (3) Three Finished Copies of Wish! Librarians, Teachers, and Parents, you definitely want this book in your libraries, so you should enter the giveaway! This giveaway is US only, and because the giveaway is tour wide, by entering the giveaway you acknowledge that I Turn the Pages is not responsible for shipping the prize, if it gets lost in the mail, etc. Don't forget to stop by the other stops on the tour to see more content surrounding Wish -- like a Q&A, reviews, and more original content! Plus, you can rack up some more entries on the giveaway! 8/29: I Turn the Pages - Mood Board <- That's me! Thank you so much to Hannah from Irish Banana Blog Tours and Barbara O'Connor for allowing me to be a part of this blog tour! Charlie & Howard (and of course, Wishbone too!) have become my favorite trio of middle grade characters! I loved getting to know them and their stories!